Vancouver Island is located in the Pacific Northwest, off the southwest coast of mainland British Columbia. Vancouver Island boasts the warmest climate in BC and Canada, along with the southern Gulf Islands that lie off the southeast coast of the island, the largest of which is Saltspring Island. The city of Victoria is the capital of British Columbia, located on the southern tip of the island. Vancouver Island is divided into North Island, Central Island, South Island, the Pacific Rim (West Coast), Greater Victoria, and the Gulf & Discovery Islands. Vancouver Island has been recognized by Conde Nast Traveller magazine as the Top North American Island for a number of years. The island is well known for its saltwater and freshwater fishing. The Northern part of Vancouver Island looks much like it did thousands of years ago. It was born from volcanic rock and it features a largely uninhabited wilderness of forests, lakes and snow-capped peaks – a unique, natural paradise. The Central part of the Island is influenced by warm ocean temperatures, sheltering mountains, tranquil lakes, and it features spectacular scenery, fabulous fishing and exceptional golf courses. This part of the island is well developed and it boasts a year-round holiday destination. The Island Highway winds passed well-kept farms in this serenely rural part of Vancouver Island. The southern part of the island is host to the provincial capital of Victoria. This part of the island combines rural charm and elegant sophistication. The region presents a remarkable diversity of landscape and recreational opportunities, with beaches and views the likes of which are found nowhere else on the coast. The Western part of the island is perhaps the most rugged. The Pacific Rim is a region of wild landscapes, never-ending beaches and spectacular weather – be it long summer sunsets or fierce winter storms. Prepare yourself for the quintessential wilderness experience in this moss-laden landscape of mist and surf, thunderous ocean and prevalent peace. Almost half of North America’s coastal rainforest, and close to 25 per cent of the world’s temperate rainforests, can be found in British Columbia. The BC Coastal Temperate Rainforest can thrive from sea level, close to the seashore, up to 900 m of elevation, where the subalpine forest begins. The climate is temperate year-round, with cool summers and mild winters (in wintertime, monthly mean temperature are above the freezing point and severe freezing events are rare). They also have a rich and extensive history of First Nations utilizing the resources found in them. The world’s rainforests have been described as the “lungs of the Earth” because of their oxygen production. Canada’s coastal rainforest is different from other temperate rainforests because it has more coniferous trees than deciduous trees. Some areas of the temperate Rainforests have trees well over 1,000 years old, and some of the trees have bases more than 30 feet around. Conservationists with the Ancient Forest Alliance located and measured two huge western red cedar trees, one of which makes it into the top 10 widest red cedars in BC, in the endangered Central Walbran Valley on Vancouver Island, British Columbia. The Tolkien Giant comes in as the 9th widest western red cedar in BC, according to the BC Big Tree Registry. It was measured at 14.4 metres (47 feet) in circumference or 4.6 meters (15 feet) in diameter, and about 42 meters (138 feet) in height. Another tree, the “Karst Giant” has been tentatively measured at 12.1 meters (40 feet) in circumference or 3.9 meters (13 feet) in diameter (no height measurement yet) and although it does not make the top 10, it is still an exceptional tree. Old-growth forests are important for the climate, but also for tourism, endangered species, clean water, wild salmon, and many First Nations cultures. The Central Walbran Valley includes the grandest ancient red cedar forests in all of Canada, in large part because the region has the finest growing conditions in the country. Tourism: B.C.’s coastal temperate old-growth forests are a global treasure and spectacularly beautiful. Parks and protected areas offer immeasurable recreational joy for visitors and tourists from near and far and support our billion-dollar tourism industry. Clean Water: On the coast, humid winds caused by the warm oceanic currents cool down when they are forced upward by the Western Cordillera Mountains. This brings 1.5 to 3.5 m of rain every year, making British Columbia’s coastal temperate rainforest amongst the wettest non-tropical areas in the world. Salmon: It might seem unusual to have fish as species living in a forest. Nonetheless, fish, for example the five wild Pacific salmon species, like the Coho Salmon, are very important components of the coastal temperate rainforest. The forest sustains some of the largest remaining wild Pacific salmon runs in its rivers and streams. 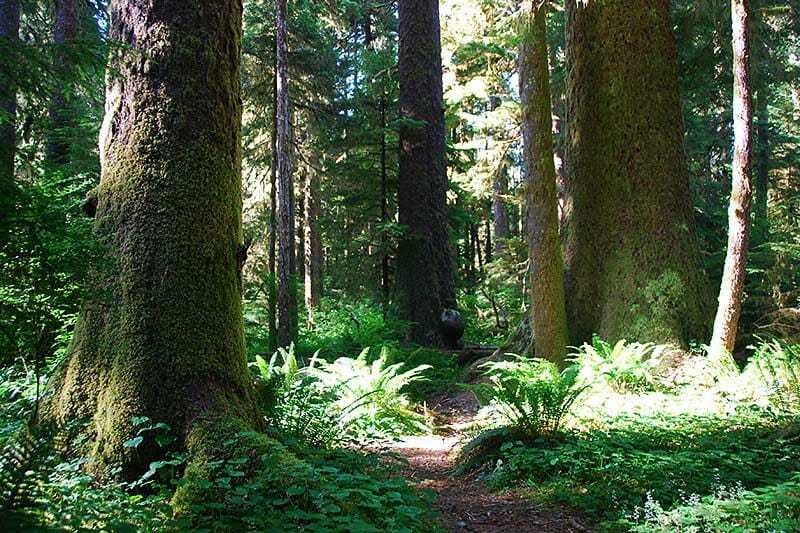 Click on the following link to download a pdf on Vancouver Island Coastal Temperatre Rainforests. Find out where they are and how to visit them.